Eighty-four migrants are missing after their inflatable dinghy sank off the Libyan coast, the International Organization for Migration says. The dinghy was found taking on water in rough seas after the Italian coast guard received a satellite phone call. It diverted the merchant ship to rescue 26 survivors and bring them to Italy. A spokesperson for the coastguard said similar boats used by people smugglers could hold 100-120 people, and were usually full. Rough seas and waves topping two metres (seven feet) hampered rescue efforts. Media captionQuentin Somerville in Libya: "It's hard to think of a more desperate place than here"
No details of the nationalities of the migrants, who were brought to the island of Lampedusa, were immediately available. Around 27,000 refugees and other migrants have reached Italy by boat so far this year, most of them setting out from Libya. Officials expect the number attempting the illegal crossing to rise because countries in the Balkans have shut their land borders. 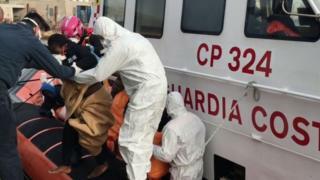 At least 800 migrants are feared to have drowned in the southern Mediterranean this year to date.